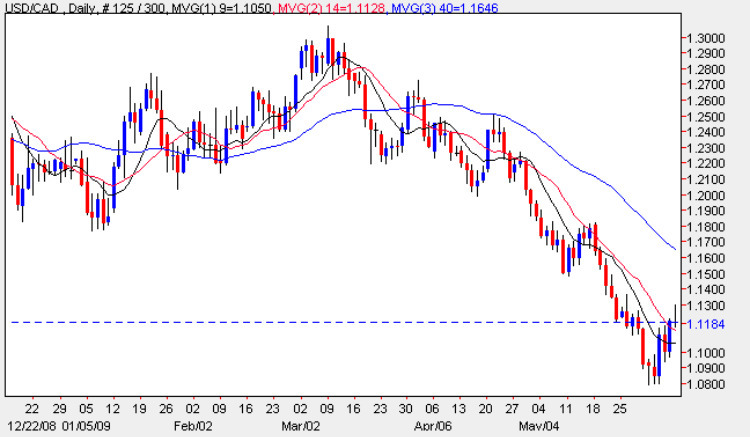 Friday’s wide spread up candle added some momentum to the initial reversal of the usd to cad pair, confirming the bullish engulfing signal outlined in Wednesday’s chart analysis, and closing the day above both the 9 day and 14 day moving averages, but interestingly failing to breach the initial resistance at the 1.12 price region. The return of US dollar strength to the currency pair was largely due to the release of significantly better than expected unemployment data in the US, which suggested that the worst of the recession could be over and that the pace of job losses was slowing as a result. Whilst it is far too early to say, the effect on the markets was dramatic with a surge in the US dollar, and a consequent reversal in many other major currencies. This market volatility may well be a feature of the currency markets for the next few months as we begin to move out of recession, with investor fears oscillating between fear of a depression, and fear of rampant inflation moving forward with low interest rates and an over supply of money in the system. The only item of fundamental news today was in Canada, with the release of the new housing starts, which came in just above target at 128,000 vs 127, 000 forecast. Technically this morning’s price action suggests that we may be seeing a further top in a series of lower highs and lower lows as the downtrend continues, but we do need to wait for the dust to settle before we can be sure. For any sustained move higher we will need to see a break above the 40 day moving average coupled with a breach of the 1.15 resistance area.